The second place I wanted to visit in Maine was Bradbury Mountain State Park. While there I had found some obvious and pretty good bouldering near the top of this hill (not really much of a mountain), it was only while wandering around the lower slopes that I found a remarkable small pile of huge boulders. 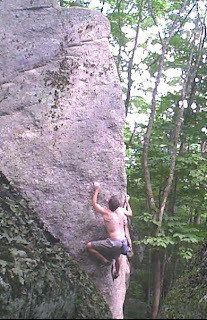 This was back in the early 90s, well before crashpads, so I brought out a rope to rappel down and clean the best lines. The first was the amazing arete called Heaven, a V3-4 that would compare favorably with any problem I have seen of the grade anywhere. I did most of the others in the area,with difficulties up to about V8, before moving to Colorado in 1994. On this trip, I mostly wanted to revisit the area and look around from the perspective of passed time. The first problem was finding the place as it had been 13 years since I last came there. Thus I missed a turn on the trail and embarked on a half hour of unnecessary bushwhacking through the trees. But at last I stumbled upon the boulders and took a look around. The first thing I noticed was the size of them. Although I had two good pads, the average height of the problems is over 15 feet, making the place more committing than most. The second was the nature of the rock, very crystally and sharp. So every attempt had to count, especially in the humid woods. I really wanted to repeat Heaven so I set up the pads and started up. A few moves up, I could not find a crucial left hand, owing to the complex crystalline texture. But after a few more false starts, I found the good holds at mid-height and worked my way to the top. The second half is an elegant balancy, mid-5.10 arete section with just enough security to offset the sight of pads shrinking at the base. A classic highball experience. Sadly I had to get back to the boat and didn't have time to climb much else so I found my way back out of the woods. Reflecting on the drive back to Portland, I realized that while I loved these areas, small, unique and rarely visited, they also had a role in limiting my vision of what was possible. The terrain around here is low-angle, technical, small hold climbing that ultimately rarely added up to a substantial level of difficulty. Yes the potential exists for harder problems at Bradbury but even for locals, I doubt the motivation is very high for working them out. So these boulders will remain as they more or less always have been, looming gray presences in the Maine forest, seeing the seasons come and go, and hosting occasionally the visit of a pilgrim or two. Well, the post was well written and I'm glad you had a great time. However, your assumption that the boulders sit there mostly quiet and untouched is wrong. There have been groups of locals climbing there quite a bit over the years. Nothing like the crowds in CO, but still regular use. It might appear different right now, just after bug season and still in the heat/humidity. 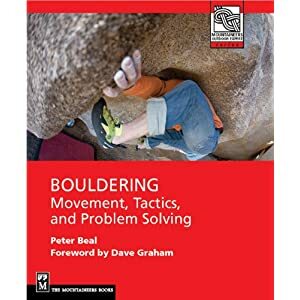 Most recently, I've heard of a small crew of boulderers who were so obsessed with the place they found a new spot (the dugout), and developed some chossier known boulders nearby. A lot of the lines have been done. I believe the center line, of the nicest overhang, with the glued flake (which local lore has it that you did the gluing) had been linked from the sit. Definitely from the stand. I was told the stand is an 8, and the sit is a 10 or 11. the hard lines to the right have been worked on, but no ascent yet to my knowledge. My time spent there was mostly a few years ago, with a different group of locals...we'd go about once a week for a while, circuiting Bradbury with a few other small local spots. Anyway, I'm glad you had a good time and succeeded on the highball. Have fun in Maine! Good to hear there's a crew or two visiting. People are taking good care of the place. Not much sign of climbers beyond a piece of tape and of course chalk. Yes, the central line on the north face of the Cornerstone was reinforced by me, owing to the sketchy rock. Might not do it now of course but it probably makes sense. I always have wanted to do the low start as well as link into the right, which I did as a 6 or 7 from the stand. I will be posting photos and descriptions on Mountain Project of the early problems I did. Obviously I hope to be able to revisit many times.